A version of the article below was also published in Bloomberg Businessweek with the caption "Icahn Chasing More Dell Cash Shows Rise of Appraisal Arbitrage." Carl Icahn’s plan to seek a higher price for his stake in Dell Inc. (DELL) put the spotlight on a section of Delaware law that is being used by a growing group of money managers to squeeze more cash from corporate buyouts. Icahn, 77, has vowed to petition the Delaware Chancery Court for an independent valuation of his 8.9 percent stake in Dell, the computer maker that won shareholder approval last month for a $24.9 billion buyout led by founder Michael Dell. Should he proceed, Dell would have to pay him whatever the court decides his stake, valued at $2.2 billion under the buyout terms, is worth. Icahn would get accrued interest of almost 6 percent on the award, regardless of whether it is more or less than he would have received through the original deal. With returns from traditional merger arbitrage waning, the battle at Dell is drawing attention to appraisals as a way to systematically profit from buyouts. Money managers such as Nicholas Maounis and Andrew Barroway, boosted by a court ruling Icahn attained years ago, have developed a strategy known as appraisal arbitrage in which they buy stock in takeover targets after a deal is announced and then seek a higher valuation from the chancery court. Under Delaware law, stockholders of companies incorporated in the state are entitled to a judicial determination of fair value in a takeover. More than half of U.S. publicly traded companies are incorporated in Delaware, the smallest state by area after Rhode Island. For years, the petitions were mostly filed by disgruntled investors as the only alternative to accepting bids they deemed too low. A court ruling on an appraisal play made by Icahn in 2005 opened the door for money managers to pursue appraisals more systematically, by analyzing stocks to find takeovers that appear to pay less than intrinsic value, then buying shares to gain appraisal rights. The strategy is a twist on traditional merger arbitrage, in which investors buy shares in a takeover target whose stock trades at a discount to the buyout offer because of uncertainty over whether the deal will be completed. Icahn, SAC Capital Advisors LP and Millennium Management LLC had challenged the price in Shire Pharmaceuticals Group Plc’s acquisition of biotechnology company Transkaryotic Therapies Inc. The investors sought appraisal on 11 million shares, most bought after the record date for determining eligibility to vote on the deal. The court said the petitioners were entitled to fair value on all shares, upending the notion that stock purchased after the record date couldn’t be included in a claim. The case was eventually settled for $37 a share, the same price paid in the merger, plus interest. The ruling allowed arbitragers to buy stock just before shareholders voted on a transaction, minimizing the danger of a deal falling apart, and giving investors more time to study financial performance as well as valuation methods and fairness opinions in takeover documents, which often are published after the record date is set. One example is Barroway’s Merion Investment Management LP, which disclosed a 5.4 percent stake in Houston-based BMC Software Inc. on July 22, two days before Bain Capital LLC and Golden Gate Capital won approval for their $6.7 billion acquisition of the company. Merion sought appraisal last month, forgoing the $46.25 a share that the private-equity firms had agreed to pay. Barroway, co-founder of one of the nation’s largest securities class-action firms, is seeking to raise $1 billion for a group of funds specializing in appraisal arbitrage. His Merion will target management-led buyouts, the type of acquisitions in which top executives, often including the founder, seek to take a company private. “The fund believes that ‘insider acquirers’ often have a greater incentive to offer and pay minority shareholders substantially less than fair value,” Merion says in a marketing document. It will target a return rate of 20 percent by enforcing appraisal rights through the judicial process. Barroway, the managing partner at Radnor, Pennsylvania-based Merion, declined to comment on the strategy. Maounis, the hedge-fund manager whose Amaranth Advisors LLC collapsed in 2006 after losing $6.6 billion on natural-gas trades, petitioned this year for appraisals of shares that his new firm, Verition Group LLC, held in three takeovers, according to the Delaware Register in Chancery. Verition sought appraisal after investment bank Duff & Phelps Corp. was bought April 23 by Carlyle Group LP, Swiss bank Pictet & Cie and others. The firm also filed petitions after the Dec. 31 purchase of Ancestry.com Inc. by Permira Holdings Ltd. and the July 2 takeover of NetSpend by Total System Services Inc.
Maounis, whose firm is based in Greenwich, Connecticut, didn’t respond to requests for comment. Of the 18 deals spurring petitions in Delaware through September of this year, at least 12 drew filings by one or more arbitragers. Merlin Partners and its affiliates targeted eight transactions, according to the Chancery docket. Merlin is run by Beachwood, Ohio-based Ancora Advisors LLC, a money-management firm founded by Richard Barone. Barone, an activist investor who started his first money-management firm in 1973, said in an interview that Ancora has done the bulk of its appraisal arbitrage for about a year, though it had some experience with the strategy previously. Appraisal judgments are paid only to those who file the petition, and can be more or less than what they would have gotten in the original deal. To qualify, an investor needs to file an appraisal demand with the target before the shareholder vote, then oppose the deal or refrain from casting a ballot. The investor must petition the court within 120 days after the deal becomes final. Legal fees can reach millions of dollars, and it typically takes one to three years for a judgment, though a petition filed in 1983 over Ronald Perelman’s bid for Technicolor Inc. required 22 years to resolve. Most appraisal claims are settled before the court rules. Quick accords eliminate the expense of pressing a case, said attorney Jeremy Anderson at Fish & Richardson PC. Awards accrue interest at the rate the U.S. Federal Reserve charges banks to borrow from its discount window, currently 0.75 percent, plus five percentage points, retroactively to the deal’s completion. Eight of the 45 appraisal actions that went through trial in the past 20 years resulted in an appraisal of fair value that was less than the merger price, according to Fish & Richardson. In a 2004 ruling on Sunbeam Corp.’s purchase of Coleman Co. for $5.83 a share, the court said the fair value was $32.35. In a 2007 case the court went the other way, ruling in response to a petition by Highfields Capital Ltd. that Mony Group Inc. was worth $24.97 a share when acquired by AXA Financial Inc., after $31 was paid in the takeover. Dell’s founder and Silver Lake Management LLC won the vote on their buyout of the Round Rock, Texas-based company on Sept. 12, after months of opposition, including a competing bid from New York-based Icahn Capital LP. The buyout group ultimately agreed to pay $13.75 a share plus a 13 cent dividend. Icahn built his stake to 156.5 million shares after the transaction was announced in February as he fought for control, then asked fellow investors in July to join him in preparing to seek appraisal rights. Conceding defeat as the buyout gained momentum, on Sept. 9 he reiterated his appraisal plan. Most professional investors view Dell’s intrinsic value in the $15 to $18 range, according to Lutin. If the court were to take two years to rule and award Icahn $18 a share, the company would owe him $3.17 billion in principal and interest, about $1 billion more than he’d get via the buyout. Outcome aside, it would be one of the court’s biggest petitions ever, said Lawrence Hamermesh, the Rudy R. Vale Professor of Corporate and Business Law at the Widener Institute of Delaware Corporate Law in Wilmington. Dell is a bad bet for appraisal arbitrage, according to Quadre’s Giffuni. With others preparing to join Icahn in filing, Dell is unlikely to settle claims because of the prohibitive cost, he said. Holders “should be happy with what they are getting,” said Giffuni, a former merger and acquisitions attorney who formed Quadre in 2009. 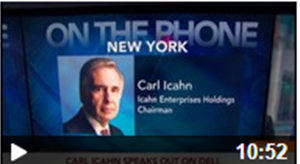 Icahn declined to comment on a possible claim. Like any petitioner, he’d have 60 days after the deal is done to change his mind and accept the terms, said Charles Nathan, the former co-head of the mergers practice at law firm Latham & Watkins LLP. “There is nothing to say that Carl couldn’t turn around and settle for the deal price when no one is paying attention,” said Nathan, a partner at RLM Finsbury, a strategic-communications firm headquartered in New York and London.